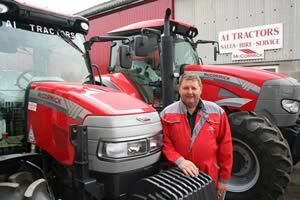 Parts and service support coverage for McCormick tractor users in North Yorkshire has been improved with the appointment of a new dealer based in Dishforth between Ripon and Thirsk. workshop and parts stores at A1 Tractors’ Dishforth premises. Frank and Barbara Ward’s A1 Tractors partnership runs a tractor and equipment hire fleet and has provided cost-effective workshop services and parts supply to local farmers for the past 21 years and is now focussing on current McCormick tractors and their predecessors. Long-serving staff member Keith Broughton and local farmer’s son Matthew Nelson handle tractor and machinery servicing and repairs, with Frank Ward’s son Richard lending a helping hand when the demands of running the family’s 300-acre arable farm allow. Specialist service training at the Harworth near Doncaster base of McCormick distributor AgriArgo UK will equip them to handle work on the tractors, together with diagnostic and other modern workshop tools. These two models are representative of a range that caters for all types of farming and rural enterprise – after all, today’s McCormick line-up stretches all the way from a 23hp sub-compact machine for large domestic and commercial groundscare work to the TTX230 arable tractor with its 225hp ‘power boost’ engine and XtraSpeed eight powershift transmission. A1 Tractors now supports this line-up in an area that extends from a line between York and Hovingham, west to Pateley Bridge, Buckton and Askrigg and north from beyond Harrogate to Catterick and Northallerton. The territory borders those of established McCormick dealers Agriplus to the north-east at Guisborough and Marwood Machinery to the south-west at Full Sutton, York and fellow new dealer N&S Moorhouse to the south at Barnsley. Having weighed up the opportunities that the new franchise offers and checked out how users and other dealers fared with McCormick products, he had no hesitation signing an agreement.